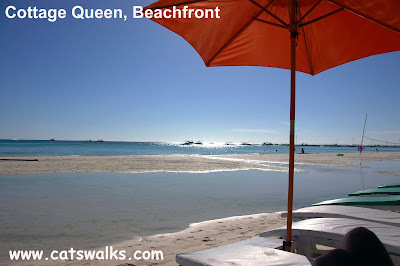 Do you want to go to Boracay but have no money to waste? Do you want to stay at the best part of white beach without selling your soul to the devil? Do you want to have the best of Boracay without putting yourself in-debt for the rest of your life? 1. Take the ferry- A long time ago we took WG and A's Our Lady of Lipa and it was okay. I am claustrophobic so I have to choose the economy class which involves sleeping on a double deck bed on the top floor of the ship . The sea breeze was great! Unfortunately, this service has been stopped by Superferry, so people who want to take the ship have to first go to Iloilo (overnight from Manila) then go by land to Caticlan which should cost you a few hundred pesos more per person and a few more hours. Cheapest ferry fare is 599 pesos (about 12 USD) until 2998 pesos for the stateroom. Superferry is the best ferry company in the Philippines in my opinion. Go to the Superferry website to book or call +63 2 5287000. 2. 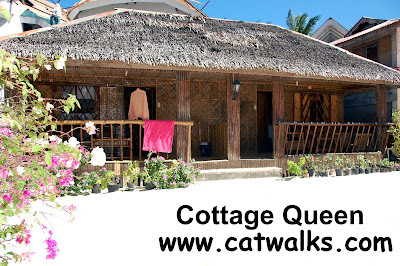 Stay at Cottage Queen, Station 1- Right next to Discovery Shores, Cottage Queen is a remnant of what Boracay used to be before the tourism rush. Perfect for those on a budget at 1,000-1500 a room (depending on the season). Don't expect high luxury here but be aware that you are on the best part of white beach for 1000 pesos per room! Their nipa huts are showing signs of age but in my opinion is still worth the money. ( 0063-36-288-30-62 or 0063-9202212430 look for Ging). 3. Eat at the Cottage Queen Carinderia- Cottage Queen has a sari-sari store where you can buy essentials like instant noodles, soap, toothpaste, etc. It also serves food! But you have to tell Ging that you intend to eat there because they don't offer. They usually cater to the staff of Fridays and Discovery so their food is reserved. Cheap and good comfort food like pakbet and sinigang. 4. Andoks, D'mall- I love Andoks! I love their chicken, and the lechon kawali. Cheap family meals. For 50 pesos you can get a 1 pc chicken with rice. 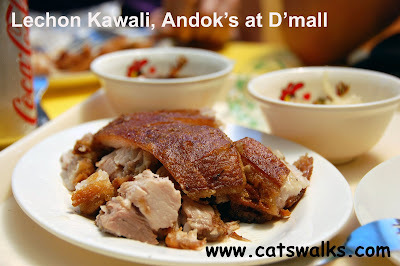 At D'mall, you will also find a lot of restaurants offering grilled chicken (chicken inasal) at reasonable prices. 5. Go to the Market- Just a tricycle ride away, it is a comfort that the market is still just a normal market. What cost a lot during beach trips are drinks. Mineral water and soft drinks cost a fortune in touristic places specially on the beach where you need to drink lots of it. The best way is to go to the market and buy a few bottles of mineral water. Mineral water is the silent money eater during trips. 6. Don't go during the peak season (April-May)- This is usually when Boracay turns into a touristic hell. It becomes dirty and expensive. Because these months corresponds to school holidays, I know that some of you must go during these months, then you just have to make sure that you go early in the season. December, before the holiday season starts, is the best month to go. Somehow the beach is just more beautiful (no annoying algae floating around). never been there myself, which is a shame since it isn't really all that far. keep on telling myself i'll get around to it when things settle down for me, but time flies by so quickly. will consider your tips when i eventually (hopefully soon) get around to making the trip. You should go as soon as possible. Everytime I go back it gets more and more touristic. I am afraid that in a few years time it will be destroyed. Makes me very sad really. true. i do hear that there's been some decline as tourist-centric development continues. :( sayang. it really is a shame. will try to visit when i can. due to time and distance constraints, i usually only make it as far as laiya, batangas. I guess it is. In celebration of my frugality, I have opened another blog just dedicated to it (it is for Zurich where I live). I live it so why not blog it? Thanks for the comment and the visit! I don't think so...it is native style. Good content! Want to know more about flights to Boracay? Please visit www.flightsboracay.ph for more information. Thanks for this info! Managed to contact Ms Ging. She sounds really nice and gave me a good deal when I reserved a room this coming July. The best thing about her is she does not require advance payment. She said we'll just pay when we get there! At least she's not somebody who's out to get your money lang. i really wanna go to boracay but i don't have enough money. But who knows one day i can visit bora..and i will apply your tips.Thanks.^_^. very informative. I got some alternate place to stay. thnx for the info..
Wow a lovely photos. You got a right choice, boracay is the best ever. Hope you can post some more photos..